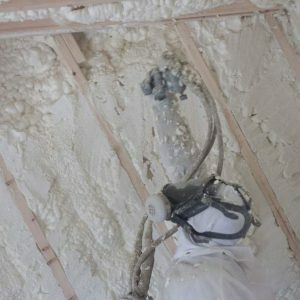 Quality Spray Foam Insulation in Brooklyn, NY . Call Today for a Free Consultation. Spray foam insulation is the best alternative to orthodox building insulation such as fiberglass and others. Among the different types of spray foam insulation, one is Polyurethane. Polyurethane was developed and used back in 1940s and it is now being used for airplanes etc. The open cell foam insulation is known foam where the tiny cells are not entirely closed. It is less expensive since it uses a lot less chemicals. Open cell foam insulation is a good barrier but it doesn’t provide any kind of water vapor barrier. In fact, it is more similar to having a sponge like look. Open cell foam insulation is commonly and widely used for interior walls as it helps with the voices and sounds and it usually sound proof. It is, however, not recommended for outdoor applications. Another type of insulation is closed cell foam insulation. Closed cell foam insulation is a lot denser than the usual open cell. It has slightly smaller cell structure. It acts as a very good air barrier and works as a water vapor barrier. It is mostly used for roofing projects but it can also be used anywhere you like in your home. Our company works to provide crucial spray foam insulation services in Brooklyn. We work on both, open cell foam insulation and closed cell foam insulation. Both are different in their own might and we know how different they are so we carefully sought them out and then go with one that is better. It protects buildings: Another important benefit of insulation is that it saves your building against moisture. It reduces the chance of harmful mildew and mold. It works to eliminate mold growth and others. It regulates temperature and moisture control: Yes, both these points. Spray foam insulation works to regulate both moisture and temperature and reduce airborne sound transfer via buildings, roof, floor etc. Spray foam insulation stops air and moistures infiltration. Moreover, it works to make your home far more comfortable and it helps on energy costs by a large degree. In addition, it adds a lot of strength to the building structure, protecting it against any possible harms etc. Moreover, it also works to keep the dust and pollen out. Spray foam insulation, therefore, has more than one benefit. It is not just good for your home for obvious reasons; it works to reduce capacity requirements, maintenance and other HVAC equipment. Thus, spray foam insulation is an ideal for most homes and homeowners should try to get it to reap its benefits. As a company located in Brooklyn, NY we work to provide spray foam insulation whenever you need. What sets us apart is the fact that we work throughout the process of spray foam insulation for you and then work to provide a solution that best suits your house details. We, as a company, are committed to help you out and improve your living. We, therefore, work to provide insulation solutions in Brooklyn that are fit according to your own house. We work to provide both types of insulation. Our main aim is to help you overcome any possible challenges related to insulation. On Spot Fixing, we can be at you place in Brooklyn in less then 1 hour. We are just a call away for your needs. You can call us with your queries and we will be readily available and happy to fix things for you. Our main aim is your happiness and we sort things out for you, piece by piece. Even after we have installed proper insulation for you, we will ensure that we provide you with customer service. This means guaranteeing you loyal support even after the work is done. You can contact us with any queries there might be and we will be readily available to help. Spray foam insulation is there to protect your home. One of the biggest benefits of spray foam insulation is that it helps reduce moisture and mold. The mold is produced in tiny spores and they tend to reproduce. There are molds that can grow on paper, wood, carpet and foods. When there is excessive moisture, mold growth will occur and this is where we come in. We as a company work to ensure that once your house is insulated, it is protected from mold, mold spores and others. SPF insulation is key in this case and we aim to provide you with that. Moreover, we also have polyurethane foam at our disposal that we install to strengthen your home. The walls in your home are the main structural component of and we work to ensure that we provide polyurethane foam insulation to protect your house. Overall, as a company we are committed to deliver excellence for you. We are a group of dedicated individuals who know exactly how important insulation is and we, therefore, work to assess your home and come up with a decent solution to insulate your house right. We are committed, we are dedicated and we want to make the insulation experience the best for you. We also have round the clock customer service support to help you during dire times of needs. All and all, if you are looking for a decent spray foam insulation Brooklyn, your answer lies with us. spray insulation Queens, NY will give you comfortable atmosphere!